Putter Reviews - Find out from an independent source whether the putter you're about to buy is actually any good! Find out whether the putter you're about to buy is actually any good! Our putter reviews are totally independent. We're not paid by any putter manufacturer, so say "goodbye" to marketing blurb and "hello" to honest opinion from an honest hands-on reviewer. Our goal is to help you find the best possible putter for you, at the best price. You can search for any putter on the planet using the search box below and our most popular reviews are linked below. Callaway Tuttle The Tuttle is certainly original - a putter that definitely looks like a driver. The good news is that it performs better than it looks! Nike Method 001 A minimalist anser head that looks just a little lightweight. The roll is pure and the feel is good. Nike Method 002 Most similar to a Ping Zing shape, this putter has a simple no-frills look, a good roll, but a high price tag. 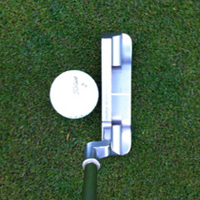 Nike Method 003 The Nike Method putter favored by Tiger Woods. 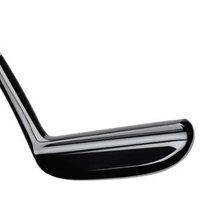 A heavily toe-weighted putter with classic looks. Fantastic if you have an open-square-closed stroke. Nike Method 004 Face balanced version of the Method 001. Favor this putter if you're trying to produce a straight-back-straight through stroke. Nike Method 005 Face balanced mallet which looks like it's got a good bit of meat behind the head. For our money the best looking in the Method range. 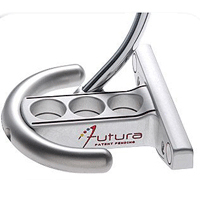 Never Compromise Voodoo Daddy Belly Putter Super-long aimline and futuristic design. Solid, affordable belly putter. Never Compromise NCX Ray Nice face balanced belly putter with a big, but light head. Odyssey White Ice 5 Larger than average blade with original White Hot insert... beautiful to look at and great feel. Odyssey White Ice 5 Classic face balanced D shape with silky soft Ice White insert! Odyssey 2 Ball Blade Padraig Harrington used this combination of blade and 2 ball design to win majors, but what's it like? Odyssey Black iX 1 Perhaps Odyssey's best effort yet to eclipse the Scotty Cameron and Ping Ansers. Odyssey White Hot 9 Classic blade shape with amazing weighting and feel. A superb putter - highly recommended. Odyssey White Ice Progressive Terron Mid Sharp edged star ship of a putter - you need to like futuristic shapes to use this one! 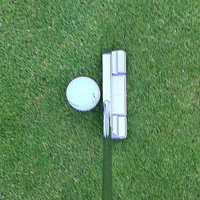 Odyssey Rossie II Belly Putter Classic D shaped head used by Annika Sorenstam amongst many others! Ping Anser The Anser is the putter that has been copied a thousand times - now available from Ping at a variety of prices. Ping Redwood Anser The design which has won more pro events than any other, now with top quality materials. Ping Zing 2 A much more attractive version of the original without the copper head that oxidizes in the sun! Ping Karsten Anser Unbeatable on price and right up there for feel and design. 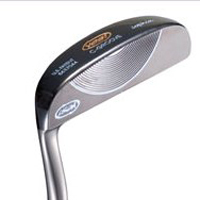 Ping Anser G5i A hideous beast to look at, but beautiful to use. Ping 1A The first putter Ping ever made. A collectors' piece now. Not great to use, and very loud! Ping J Blade Possibly the ugliest putter Ping has ever made ... and it feels dreadful too! Ram Zebra Iconic putter from the 1980s & 90s. Face balanced and with a great alignment aid. 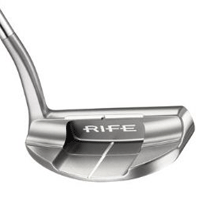 Rife Two Bar A putter that looks and feels good behind the ball. Just a bit firm on the feel side. Scotty Cameron Newport 2.5 Center Shaft The classic shape, different hosel ... but same awesome feel. Scotty Cameron Newport 2 Studio Select The affordable Scotty Cameron. Scotty Cameron American Classic 3 A simply gorgeous reworking of the Bullseye shape. New materials and great Scotty Cameron workmanship make this a beautiful putter to look at. Still not that forgiving, though! Scotty Cameron Bullseye Platinum Heavy Flange A Bullseye putter worthy of consideration! 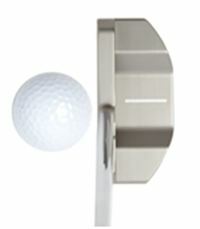 The offset neck and flange aren't quite what you'd want if you're a purist looking for a bullseye, but it putts better. Seemore FGP Original A revolutionary putter which has now won 2 major championships thanks to its combination of roll on fast greens and patented riflescope aiming design. Well worth considering! TaylorMade Rossa Kia Ma Fortuna A highly refined mallet from TaylorMade - recommended! TaylorMade Ghost TM-110 Beautiful square-designed Anser with great aimlines - well worth a look! TaylorMade Ghost Corza Beautiful square-designed Anser with great aimlines - well worth a look! TaylorMade Rossa Daytona Well constructed Anser style putter - excellent if you're after a good putter at a lower cost - gunmetal color looks classy - feels good too! Yes Tracy 2 (C-Groove) In our view the classiest Yes putter - anser-style head with the amazing C-Groove for a terrific roll. Yes Natalie (C-Groove) Futuristic design with amazing roll and super long aimline. Yes Donna (C-Groove) Wide bodied anser-style head with the amazing C-Groove for a terrific roll.